Arq. Myriam Mahiques´art: House in La Boca, Buenos Aires. Casa en la Boca. I took this picture in 2002, walking in the neighborhood of La Boca, Buenos Aires. It was originally built by Italian immigrants, with the materials and paintings they could take from the ships. 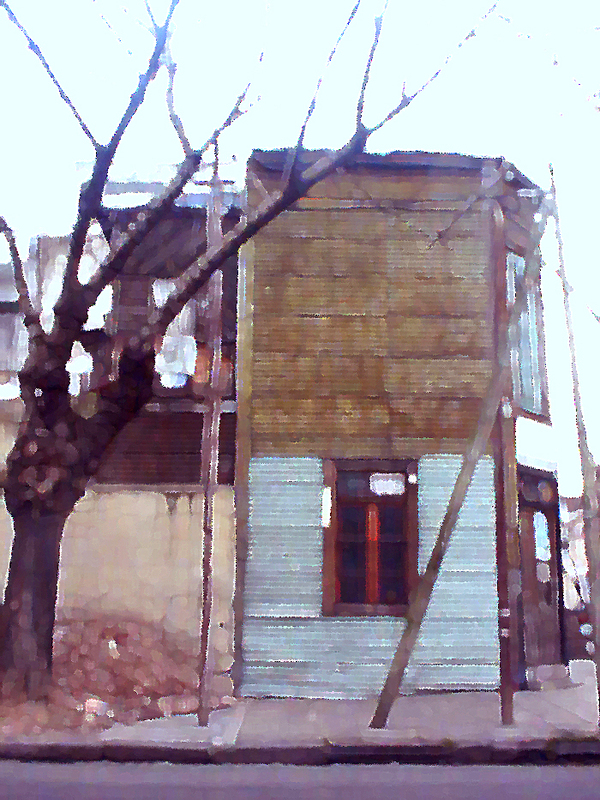 This is one of those old houses. Now, it's a memory for me, so I like to show it as a painting. It's nice to see how the tree branches and the lamp posts are in equilibrium with the horizontal lines of the metal sheets. Verticality against horizontality. Coming back to my previous post Is photography a representational art? one could ask if, there was need for me to touch the original photograph, if this kind of ¨painting¨ is better than my picture. In this case, I should say, yes, this version is better, if it shows my objectives, the emphasis on textures and yuxtaposition of lines. The picture was taken with one of the first digital cameras and did not reflect what I wanted. The original was representational for the house, but not for my intentions.